Rain haunted our September 10 event. We had planned for a rain-date of the 18th, but it would be too complicated to drag everyone else in for a second time, let alone re-advertise the event. The local Leaf dealer was a bomb, not even bringing a vehicle to the event. I supplied a Leaf owned by a EAA of NWO member. There were, perhaps, about sixty people at the four hour event, about fifteen ride-and-drives and a host of onlookers and passers-by. A short rain began before the event, and likely had an affect on the overall attendance. Rain subsided before noon and stayed sunny until about 2pm. After 2pm there were a few hit-miss showers that significantly slowed the foot traffic to the site. 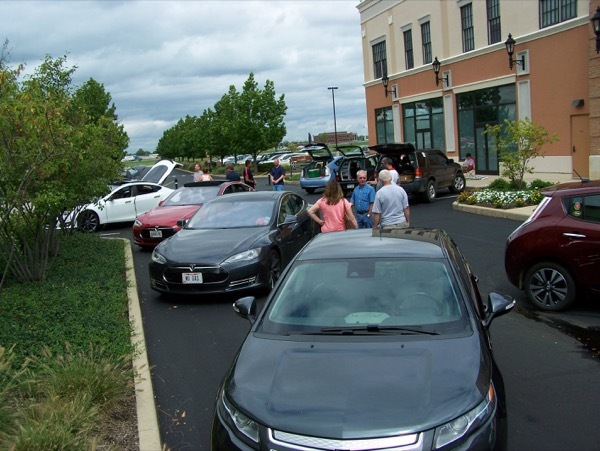 This year's Ride and Drive event is offered once again at The Town Center at Levis Commons. Located in Perrysburg, this fine shopping complex is located on State Route 25 (Dixie Highway), near the junction of I-475 and I-75. Bar Louie, one of the on-site restaurants, will be offering 10% meal discounts to patrons who participate in the ride-and-drive. Coupons will be available at the Electric Auto Association of Northwest Ohio tent. We have a great selection of vehicles this year! Scheduled are vehicles from BMW, Cadillac, Chevrolet, Ford, Nissan, Tesla, and Toyota; what a great mix! The rain-date will be September 18, and will be announced - if necessary - via email or phone. We are anticipating a strong turn-out and will strive to hold the event on schedule September 10. Note there is road construction! However, access is still relatively easy. See direction choices below. From south-bound I-475 - Exit at SR25 (before the south-bound I-75 interchange) and turn to south. Levis Commons Blvd. is on the right at the traffic light. From south-bound I-75 - It is necessary to follow a detour that takes you further south to State Route 582. Exit at SR582 and go west a short distance on SR582 to the traffic light. The traffic light is the intersection of SR25. Turn to north and go a few miles to get you back to the Levis Commons Blvd. on the left. From north-bound I-75 - It is necessary to exit at State Route 582 before reaching Perrysburg. Turn to west on SR582 to the traffic light, then right on SR25. SR25 will then take you north a few miles to the Levis Commons area. Levis Commons Blvd. will be on your left at a traffic light. Registered attendees report 71,871 electric miles driven.